With over 70 years combined experience within the industry, the team at Low.Co Customs strive to bring you the very best in what the Gold Coast has to offer, whether you need a panel beater, spray painter, mechanical expert or trimmer. We offer a wide range of services from Complete Restoration of any car or motorcycle to a full custom build and everything in between. Low.Co Customs was established on the Gold Coast in 2013. Owner Dane started his career as an apprentice panel beater in New Zealand which soon changed to a spray painting apprenticeship. In 2010 Dane moved to the Gold Coast and continued working in the automotive industry. During this time Dane noticed an unmet demand in the availability of custom shops. This is where the dream of Low.Co Customs began. Whilst still working full time Dane began working weekends and after work hours from his home on the Gold Coast, doing panel work for friends in the garage and then hiring out the paint booth from his employer for paint work. As word began to spread Dane soon found he had enough demand from his referral network to open his own shop. Low.Co Customs was born! The risk paid off and soon the work demand became too much so Dane decided to ship his cousin Andre over from New Zealand to work alongside him as his apprentice. From there Low.Co Customs started steadily growing and becoming a well-known name within the industry with a loyal base of car enthusiasts. Over the next 12 months working out of the small 165 square metre shop in Southport the customer base continued to grow. A large 1975 square metre shop became available in Arundel on the Gold Coast. Despite the lack of funding behind the decision, it was too good of an opportunity to pass up to expand the business. The move almost sent Dane broke but with his determination he just managed to pull through and thus the Low.Co empire grew. Moving to the bigger premises helped us expand the business and fulfil Dane’s dream of owning and running his own custom car modifications business. 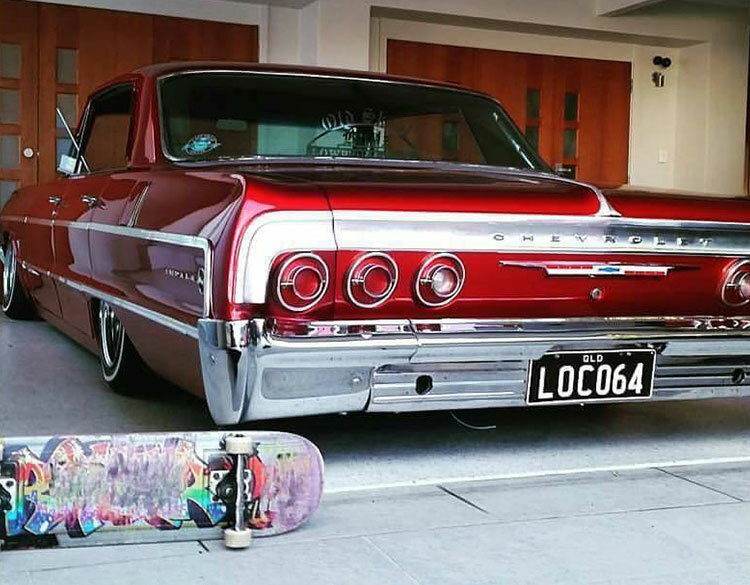 Just before the move, on the side, the build of LOCO64 Dane’s candy red 64 Chevy Impala was completed in just 6 months, which has now become one of the faces of Low.Co Customs and with the Lowrider community. The build of LOCO64 has lead to building some of the well-known lowriders on the coast. Moving to the bigger premises has been the best thing for the business and the Low.Co family has grown to two full-time painters and two in-house spray booths, a team of skilled and qualified panel beaters as well as Dane’s full-time qualified parts interpreter and personal assistant to help handle the shop alongside him. Towards the end of 2016 and beginning of 2017 Low.Co expanded once again with taking over the premises next door and releasing Low.Co Mechanical with it its highly skilled mechanic and apprentice. Shortly after we expanded again to include Low.Co Trimming and making us a true one stop shop for all things relating to Customs panel & paint, Mechanical, and Trimming. There are more big plans in the pipeline for the Low.Co Empire so stay tuned and see what the future has to hold. If you have any queries on anything we offer, please feel free to Contact Us.